Star Base Andromeda is a Lincoln science fiction, fantasy, horror and action/adventure club, which holds weekly meetings at The Coffee House in downtown Lincoln. Approximately every six weeks, we hold a Book Discussion meeting -- currently at the UNL Student Union near the food courts -- for which all attendees are encouraged to have read the same book for group discussion. Our book selection for December 10, 2013, is the legendary anthology "The Science Fiction Hall of Fame Volume 1, 1929-1964", edited by Robert Silverberg. SBA meetings are open to anyone who wishes to attend and participate. Our book club is hosted by a different bookseller each month, and each book selection will focus on a different genre. The book club is open to everyone and it’s the perfect opportunity for readers to branch out and find new favorites while getting to know your booksellers! Come in and grab your copy of this month’s selection (Conor's pick), Blood on the Mink by Robert Silverberg. The next selection will be announced at the meeting. Book club members receive 20% off of the current book club selection! Reading Blood on the Mink by Robert Silverberg. Diana Gabaldon signs 20th Anniversary for her Outlander Series. Lawrence Block promotes A Drop of the Hard Stuff. ; Robert Silverberg promotes Times three. Star Base Andromeda "Book Discussion Week" - "Dying Inside"
Robert Silverberg's book Pulp Literature Spring 2019 is currently available from LibraryThing Early Reviewers. Robert Silverberg's book Time and Time Again: Sixteen Trips in Time is currently available from LibraryThing Early Reviewers. Robert Silverberg's book Lord of Darkness was available from LibraryThing Early Reviewers. Robert Silverberg's book Tales from Super-Science Fiction was available from LibraryThing Early Reviewers. Robert Silverberg's book Visitants: Stories of Fallen Angels and Heavenly Hosts was available from LibraryThing Early Reviewers. Robert Silverberg is currently considered a "single author." If one or more works are by a distinct, homonymous authors, go ahead and split the author. 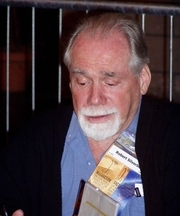 Robert Silverberg is composed of 64 names. You can examine and separate out names.